Noise pollution in the oceans causes mental and physical harm to marine animals and makes it difficult to carry out ordinary tasks like finding food. Ending this problem is as simple as enacting regulations that prevent certain types of artificial sound. You can join us in taking action on this issue here. Imagine hearing a jackhammer outside your bedroom window as the sun rises every day — that would be annoying, wouldn’t it? That’s essentially what marine animals are contending with on a daily basis. 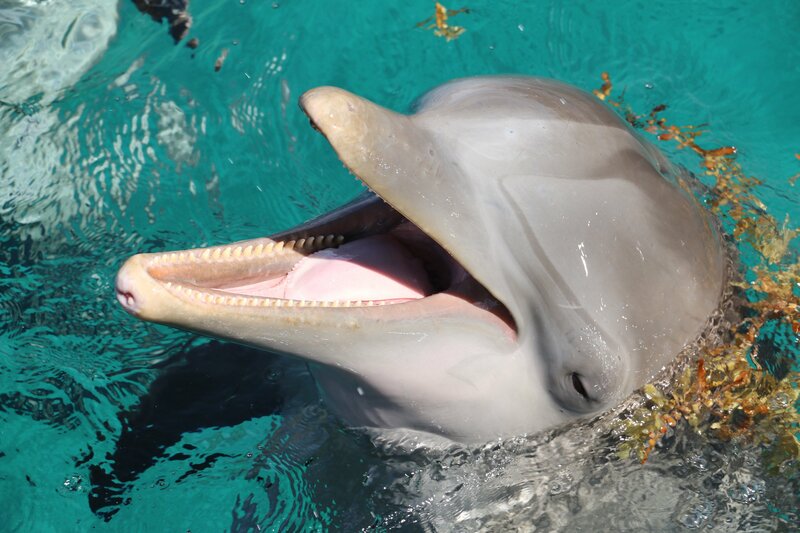 In fact, the oceans have gotten so noisy that dolphins are changing how they speak with one another, according to a study from the University of Maryland Center for Environmental Science. A team of researchers, led by marine biologist Helen Bailey, installed underwater microphones at the bottom of the Atlantic Ocean off the coast of Maryland in 2016 to record ambient noise levels. They discovered that dolphins were adapting their communication sounds to be heard over the noise of boats in shipping lanes. Bailey’s team found that dolphins were whistling at higher frequencies and with less complexity during periods of high noise pollution. Since dolphins have complex languages, this simplification could hinder the amount of information being conveyed and could therefore diminish their ability to navigate their environments. Additionally, noise pollution causes mental and physical problems in animals, just as it does in humans. This is especially true for marine animals because noises travel further underwater, and some animals can even die from prolonged exposure to harsh and loud sounds. The ocean advocacy website Marine Insight notes that noise pollution can cause hemorrhages, internal organ damage, and significant stress. Animals exposed to high levels of noise pollution have extensive damage to their ears. Noise also causes animals to migrate to new areas, potentially disrupting their ability to mate and find food. Marine noise pollution comes from a variety of sources. Boats create sound as they move through the water, and more sound when they honk or send sonic signals. Mining operations on the seafloor create a continuous roar of sound, and oil extraction efforts involve piercing bursts of noise. Additionally, fossil fuel companies often use powerful seismic blasting techniques to locate oil reserves and other resources, and military vessels contaminate the water with widespread sonar. Taken together, this constant noise pollution is causing immense harm to marine life of all kinds. "Noise travels very far underwater and seismic blasting sort of has a double whammy," he said. "It makes a loud, explosive sound that’s on par with dynamite every 10 seconds or so and that can cause very acute impacts in wildlife, but it also raises background levels of noise for hundreds, even thousands of miles, making it difficult for many species to hear and communicate." "It can also cause mortality in invertebrates and young fish," he added. Bailey’s team said that regulations should be enacted to reduce noise levels throughout the oceans, and certain practices should be halted altogether because of the harm they cause to animals. Their research was published in the journal Biology Letters.